Anesthesia and older dogs can be a worrying combination for senior pet parents. As Fido of Fifi ages, the chances of their needing surgery for an illness/injury/dental or other issue rises – but so can the risks of giving them an anesthetic. The good news is that being older doesn’t automatically mean that your dog will be in danger if he’s anesthetized! General health, organ function, evaluating the risks v benefits of any procedure, and proper testing/screening prior to anesthesia being administered can all make the whole situation much safer – and less worrying for everyone. 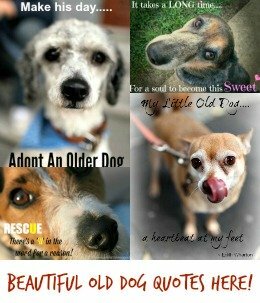 Our older dogs have often accumulated a handful of health problems over their lifetime. If we’re lucky they’re of the minor variety… but it’s not at all unusual for them to develop a chronic or serious illness/condition either. Also organ function in senior dogs (heart, liver, kidneys, lungs etc. ), even apparently healthy ones, is often not as strong as in younger dogs. The physical demands of anesthesia and a surgery or procedure have the potential to make an underlying condition more serious. Any medications that your dog takes on a daily or regular basis for a chronic condition can also has the potential to interact with other drugs used during anesthesia or to treat other issues. Senior dogs can experience more anxiety than they did in their youth. Failing sight or hearing can make their world a confusing, scary place. Old Dog Syndrome (aka Canine Dysfunction Syndrome) which is similar to Alzheimer’s Disease in humans often causes confusion and disorientation. The emotional stress of a veterinary visit/stay and the accompanying stresses can ramp up anxiety and confuse an older dog. It can also put extra stress on the heart and other organs, if these are already compromised this is another complication. Older dogs bodies (and human bodies for that matter!) absorb, metabolize and excrete medications and chemicals in a different way to younger ones. Depending on the drug/situation it may mean that dosages should be less, or less frequent, or more frequent… or an entirely different product should be used. 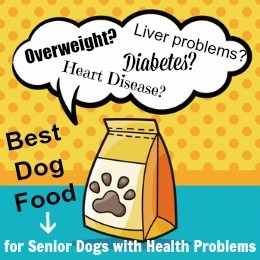 Senior dogs also tend towards carrying either too much fat or too little fat, and either of these can change the way their bodies respond to drugs, as well as interfere with body temperature regulation. Even given the risk factors above, the combination of anesthesia and older dogs doesn’t have to be a no-no. Being aware of the potential problems gives you the power to reduce or even eliminate their effects, making anesthetizing your senior dog a much safer experience. Your veterinarian will help you evaluate the situation, and weigh up the pros and cons of going ahead, or leaving things be. Your dog’s age, general health, remaining lifespan, quality of life, comfort level and prognosis are all part of this equation. If after evaluation and discussion it’s clear that your golden oldie needs to be anesthetized for a procedure, there are many things that you and your veterinarian can do to make the whole process safer for him/her. Having a panel of tests completed by your vet prior to the surgery is highly recommended. In fact, this may even be required/mandatory for older pets at your vet clinic. 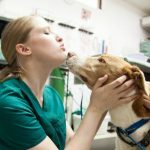 Younger pets are likely to have very basic pre-anesthetic testing done, but when it comes to giving anesthesia to older dogs there is usually a more comprehensive screening. Blood tests are the most common ones. A urine test, X-rays and/or ultrasound may also be a part of the pre-anesthetic/pre-op screening. Once your senior dog has passed the initial screening, there are a number of additional things that a veterinarian can do to minimize the risk factors concerning anesthesia and older dogs. Every dog and every situation is different and your veterinarian is the expert so his advice/recommendations should definitely be what you use to make your decisions. Extra fluids might be given before/during/after surgery to help maintain blood volume, proper organ function (especially the kidneys) and to prevent dehydration. Additional Oxygen may be given before the anesthetic is administered. This can help keep your senior dog’s lung function cope with the effects of the anesthetic. He may also get some supplemental oxygen during the immediate post-op recovery period. Sedative Medications could be used to help relax your dog and reduce the anxiety and stress he might be feeling. Extra-close monitoring of your dog’s heart rate, respiration, oxygen levels, body temperature and blood pressure can help make sure that everything is staying within acceptable limits during surgery and recovery. Choosing the best form of anesthesia for your dog will be your veterinarian’s responsibility and he will take into account age, general health, specific health conditions, current medications and breed (among other things). Preventing hypothermia is an important part of pre/during/post operative care for all pets, but it’s especially important for older or senior dogs who may have trouble maintaining a normal body temperature in this situation. Reducing post-operative pain is important. Pain can put a lot of extra stress on your dog’s body and the way it functions, so finding the right pain medication, in the right dose, for your senior dog is very important. Veterinarians and other animal health professionals seem to agree that although anesthesia and older dogs can pose some additional risks, but that there are many ways to reduce these. If your older dog has a condition or injury which needs to be treated under anesthetic and it will cause him pain/poor quality of life/get significantly worse without treatment (or is life threatening), then NOT going forward with the procedure simply due to age is not recommended. The responsibility and decisions concerning your golden oldie’s surgical care (this includes pre-op/anesthesia/surgery and post-op) is down to your veterinarian. But you have an important role to play too! Educating yourself so that you know the risk factors, options and counter-measures available and being willing to commit to any pre-op work or additional procedures can make a big difference. Also, remember to tell your vet everything you can about your dog’s health, current medications, previous surgeries or illnesses and ANYTHING that may seem even slightly relevant. The clearer the picture your vet has of your older dog’s health the easier it will be for him to set up the right protocol and care system. My 13-year-old dog had surgery 4 days ago and is experiencing some incontinence. Is this normal? How long does it last?